Today was the start of our adventure. We had to cross the Missouri River with our family. I was nervous because I have my younger siblings to worry about. I paid $25 for the ferry to be able to cross safely. Thankfully, nobody got hurt. 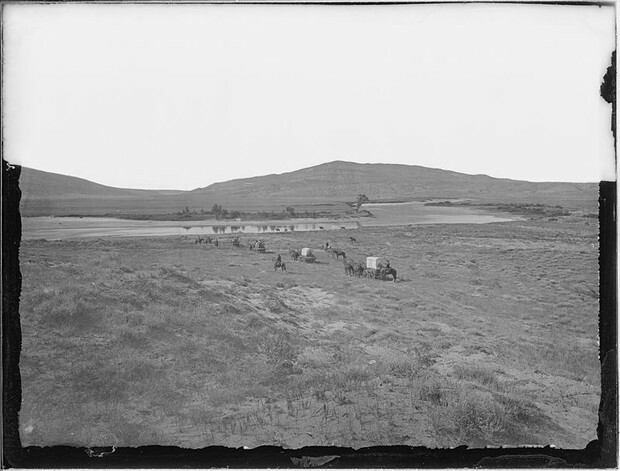 Later in the , the land was very dry and water was scares. But we managed to live. Our next priortiy was to hunt. i used my gun but sadly did not get anything. My family managed to get threw with all the dried food that we brought. At the end of our exhausting day we ran into a gambler. he asked us if we wanted to trade. We accepted! We showed him our amazing strengths and we got rewarded $25! Broken wagon. Digital image.Flickr. Flickr, 4 May 2010. Web. 7 Mar. 2015. 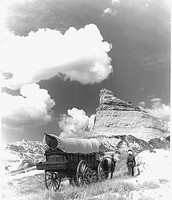 Covered wagon. Digital image. Flickr. Flickr, 3 July 2011. Web. 7 Mar. 2015. 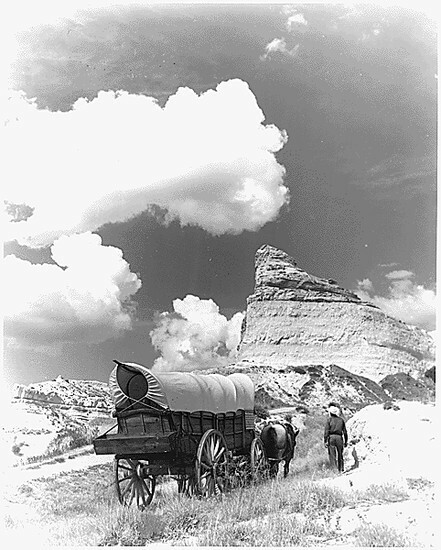 Conestoga Wagon on Oregon Trail Reenactment 1961. Digital image.Wikimedia. 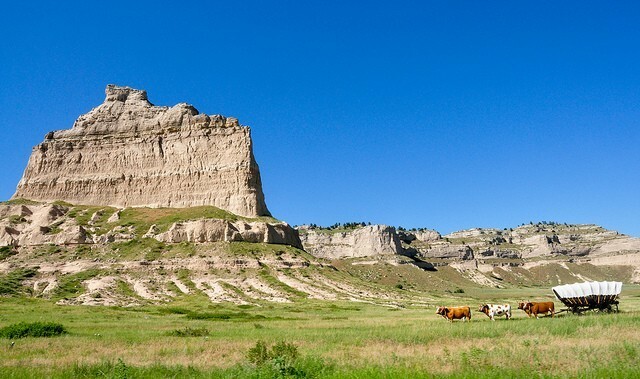 Department of the Interior National Park Service, n.d. Web. 7 Mar. 2015. The beginning of the day starts with a tragedy. Tim Breaks his leg. Later in the day we ran into a tribal leader. He wanted to test us. He said if you can balance a book on you head while holding 2 books in your hands you get a prize. He reward ed us with 5 ammunition boxes and 5 blankets! Later on we came along a river. We restocked our water supply so we will never run out. We then had another choice to be made, pay $45 to cross the river safely, or don't pay and risk your life. I paid the $45. We safely crossed. Later in the day we hunted. It was very successful! we got 30 pounds of buffalo. At the end of the day we had to made a choice, what trail to take. We took Buffalo Grounds Trail. The start of the day we had a huge problem. We ran into a Indian on the Burial Trail. They told us to turn around of they kill us. This made a huge set back. 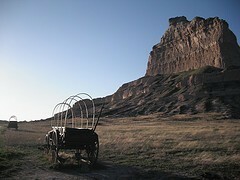 We get lost on the way back to the beginning of the trail when Mary falls out of the wagon and gets run over. Thankfully, she only broke her leg. We get to the start of the trail and start were we reached the river. We had to make another important choice, if we pay the ferry or go arose ourselves. I paid the $50 and crossed safely. Just when we feel safe we get attacked by native americans. We lost all our supplies. Thankfully, this horrible day goes to a end. Everything is going smoothly. nobody is getting hurt and we are moving along the trail pretty good. We ran into a fork in the road and had to chose a trail. we chose to keep going straight even though a winter storm is coming. We had to test our skills by throwing dice into a trash can to see if we will make it. Amazingly we did! !